Posted on March 20, 2018 at 5:35 am. College Awareness continues all week long. So mark your calendars, everybody: Wednesday is College Clothing Day — so be sure to wear your favorite college t-shirt, sweatshirt, or school colors. Then on Thursday, the Student Services Staff will be judging the College Door Decoration Contest. Create a display about your TA teacher’s alma mater — and you could win WOLF PAWS for your entire TA! And finally on Friday, it’ll be College Trivia on the Morning Announcements — put your knowledge to the test about universities in the US. We’re celebrating College Awareness — so let’s get PUMPED about College, wolves!! SOL make-ups continue in the library today. Students taking the Writing Test should report to the library at 8:30 this morning, and should ONLY bring an iPad. As for everyone else — please be QUIET and CONSIDERATE when walking through the main lobby today. Good luck, test-takers! Read any good books lately? The “Talk about Books” Club” — a.k.a. TAB — will be meeting TODAY during all grade level lunches in the library Conference Room. So grab your grub and come take a look at these Totally Awesome Books!! The WMS Helping Hands Club is “helping” kids with cancer… but they need your HELP!! There will be a charity candy drive — TODAY after school by the cafeteria. All money raised will go to Saint Jude’s Children’s Hospital — and the Leukemia and Lymphoma Society. So bring your money, get a sweet treat, and HELP these deserving kids at the same time. See Ms. Compton or Mr. Johnson with any questions. The Kindness Club will be meeting TODAY in room 134 during ASP 1. All are welcome to attend — even if it’s your first meeting. Help spread kindness throughout WMS and our shared community! See Ms. Schaefer with any questions. Need help with Spanish? The Yorktown tutors are coming back — TODAY during ASP 2 in room WW 6. Get extra help with grammar, vocab, and everything you need to succeed! But you MUST sign-up with your Spanish teacher ahead of time to attend, or see Senora Stewart with any questions. Hasta pronto! The Boys Cohort meeting is CANCELLED for today. The next meeting is now scheduled for April 16th. See Mr. Hicks, Mr. Eason or Mr. Valdez with any questions. Calling all science fair participants! You are invited to the USA Science and Engineering Festival, which is scheduled for Friday, April 6th. This exclusive event offers the chance to explore nearly 3,000 hands-on exhibits from the world’s leading scientific and engineering societies, universities, government agencies, high-tech corporations and STEM organizations. But to attend, you MUST sign up by THIS WEDNESDAY. See Ms. Cameron for a permission slip, or with any questions. It’s down to the Final Four in the WMS Tournament of Books. With over 1,200 votes last week, we had some major upsets. “Hammer of Thor” CRUSHED the “Maze Runner”, and both “The Red Pyramid” and “Peanut” dominated their competition. So who’s gonna make it to the finals??? Make your pick by using the QR code by the cafeteria, or follow the link in today’s Morning Announcements Blog. There’s four great books left, but only ONE can be the CHAMPION!! 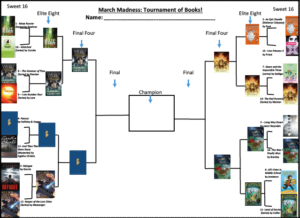 *CLICK HERE* to vote in the March Madness Tournament of Books!